Yesterday on my way home from exercise class I stopped at a thrift shop and one estate sale. The thrift shop coughed up this vintage Brick Road pattern quilt top for $3. It was a long skinny piece that I split and stitched together to make a lap quilt that will measure apx. 42×55. Plenty of room to get cozy this winter. < Free form Scrappy Crocheted Finished! Don't you love 'finds' like this!! I always feel like I live in the wrong century! You're right Robbie. 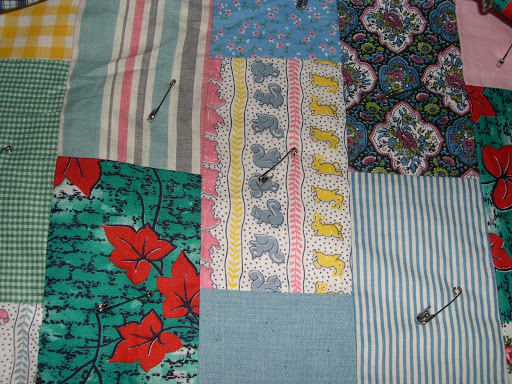 I think sometimes I was born too late but I really appreciate the historical aspect of vintage textiles. I love to hand quilt and am still hand quilting what I call a drag along quilt. What a nice find this is!! Where else does a bit of history get to keep you warm AND give hours of entertainment?! So glad to see that hand stitching is coming back – there was a ton of it at Quilt national this year! 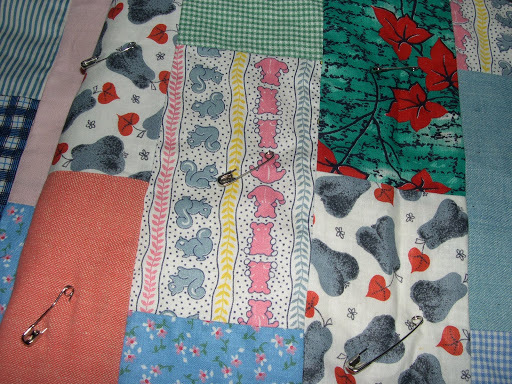 Many years ago I taught hand quilting without a hoop or frame. Now my arthritic hands won't do the tension part so I have moved to a frame. Not quite as satisfying but an adjustment that had to be made. Love the novelty prints and the deer does remind me of Jay's. 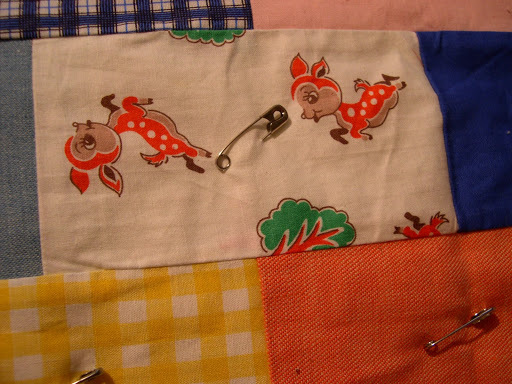 I love to hand quilt but still do it loose or with a small hoop. It seems like frame is too hard on my hands. Just glad you are still able to do it. THanks for sharing.